Looking forward to work with ​Marilyn Arsem in the residence program CO-CREATION LIVE FACTORY Prologue 1 of VENICE INTERNATIONAL PERFORMANCE ART WEEK. Presentation of the AiR take place at Palazzo Mora European Cultural Centre in Venice. Many thanks to: Francesca Carol Roll, VestAndPage, Marilyn Arsem! 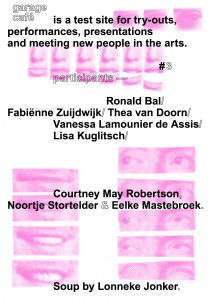 Supported by: CBK Rotterdam (Centre for Visual Arts Rotterdam, NL). You are cordially invited to the studio presentation Moving Landscape, on August 25, 2017 at 8 PM at artist-in-residence Cloud Danslab Den Haag. Moving landscape unfolds as a multidisciplinary research on the concept of landscape in performance art. Artist Ronald Bal transforms Cloud Danslab into a hybrid place, where performers from different disciplines (dance, circus, and visual arts), explore embodied responses to the imagination of the concept landscape. 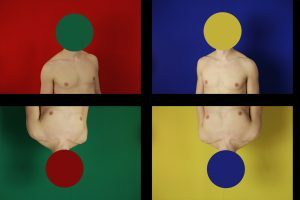 This results in a performance installation with a sculptural and abstract dance that relate to the paintings of Mondrian. In Moving Landscape, Bal sharpens the relationship between painting and performance art, the figurative and the abstract, manipulation and nature. By emphasizing the sensory and imaginary conditions of the painter Mondrian, a playing field arises for an encounter between different artistic disciplines. 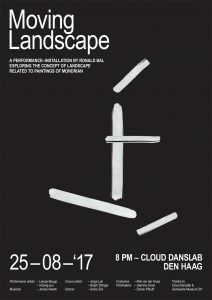 The presentation of Moving Landscape is the first result of Bal’s research on the concept of landscape and will be developed further in the coming months into a performance-installation. You are cordially invited to the performance artwork ‘Reflex II’ at Garage Cafe Rotterdam on Thursday April 6 at 6:30 pm. The performers are Larysa Bauge and Hsiang-yun Huang. Many thanks to Amy Kan and Karin Arink and Sue van Geijn for hosting and curating the event. I’m deeply grateful to be part of Venice International Performance Art Week 2016 at the Palazzo Mora in Venice. During the event I did a performance about ‘body shock’. Many thanks to VestAndPage (Artist and organizers of Venice International Performance Art Week) and Cristiana Zeta Rolla (Artist) and Francesca Carol Rolla (Curator). 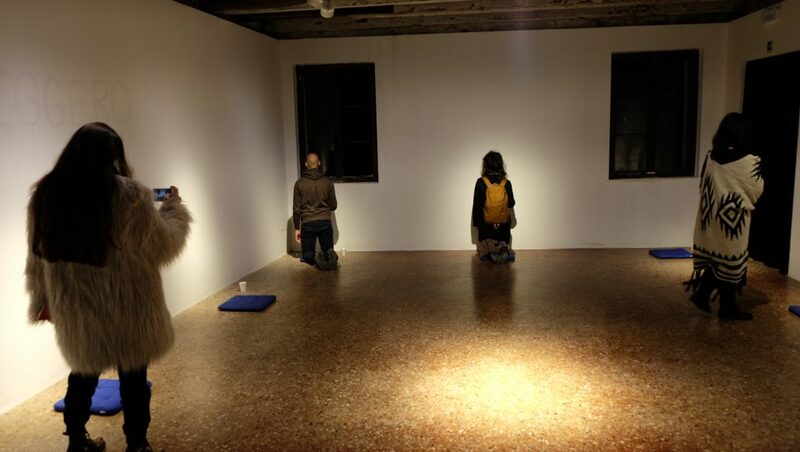 Durational performance at the Palazzo Mora, ART WEEK | FRINGE of the III Venice International Performance Art Week 2016. Image © Caterina Ragg. You are cordially invitedinvited at the performance event ‘Highs & Lows’ at OT 301- 4Bid Gallery where I will perform the performance ‘Reflex’ on december 1. More information about the event at OT 301- 4bid Gallery. 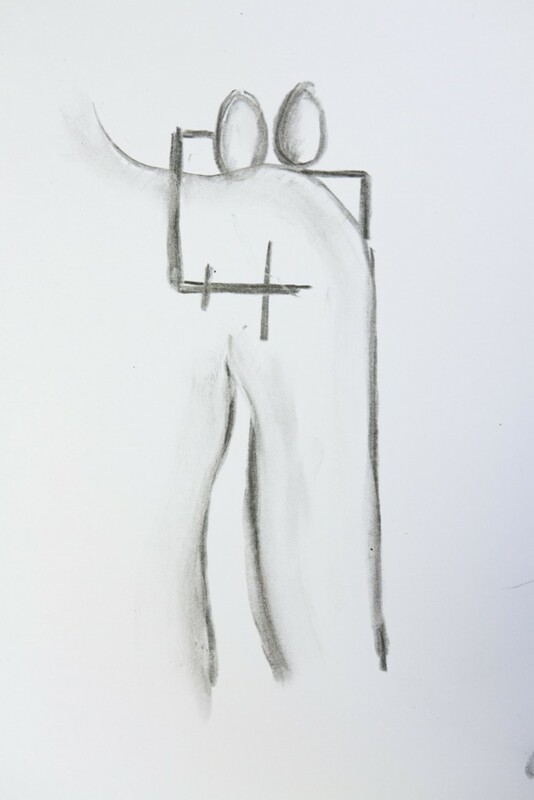 Reflecting on the ‘performative body’ Ronald Bal works with words, time and body movement. In 4bid Gallery in Amsterdam, Netherlands, Ronald will perform the performance ‘Reflex’ showing a body in three repetitive stages, sanding, walking and running, in varied tempos and rhythms. The scenography was a screenplay showing words and time. The words change every thirty seconds so the reader could interpret word and action, and make short sentences over time. The screenplay shows 40 words, often used as directions in a rehearsal,that provoke the body directly. 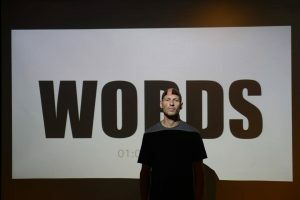 The words repeat every 20 minutes showing a different reading related to the body. During the month of November (2016) my performance ‘Jolts Of Barbarous Blue’ is shown at ‘Project Wall’ in Galeria Raczej in Poland. During “Everyone’s perfect 4 ‘ International Queer Film Festival in Geneva, the movie “Resume” is displayed on 14-22 October 2016. You are very welcome to the festival. My research project Pulse is published in Barbed Magazine #04, page 65. Bal examines how the digital world affects our bodies, and by extension, how the digital world determines time, place and space. The digital world has become part of our ‘natural’ habitus and thus gives rise to new forms of perception and identity. We have all become cyborgs as Donna Haraway famously claimed. The concepts interiority and exteriority are central in this study. Interior: body, individual, mind and state of being. Exterior: public space, language and society. 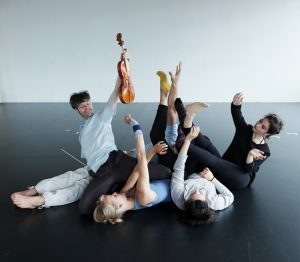 The project consists of short films and live performances, which are connected to each other by a narrative structure. Pulse | Motion Pictures is part of his research project Pulse.